New York is abuzz with hot new pop-ups, must-see gallery openings, and a whole lot of rain, it seems, at least through the end of this week. But we’re not letting that dampen the mood. Between an Old Masters show at David Zwirner, a star-studded group show curated by artist Nina Chanel Abney at Jeffrey Deitch, and an all-too-brief exhibition of up-and-coming high jeweler Ana Khouri’s stunning pieces at Phillips, the best views in town are to be found indoors. Encompassing almost a millennium of artmaking from the 12th century to today, this monumental exhibition of over 130 artworks is organized into six ambitious themes: Monsters & Demons, Dreams & Temptation, Fragmented Body, Unconscious Gesture, Super Nature, and Sense of Place. 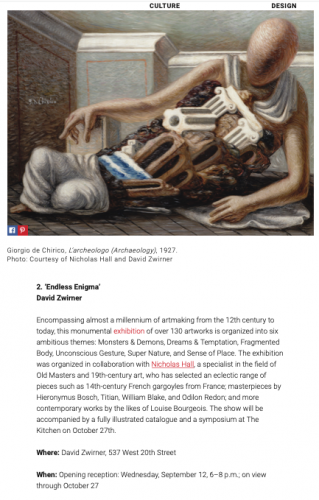 The exhibition was organized in collaboration with Nicholas Hall, a specialist in the field of Old Masters and 19th-century art, who has selected an eclectic range of pieces such as 14th-century French gargoyles from France; masterpieces by Hieronymus Bosch, Titian, William Blake, and Odilon Redon; and more contemporary works by the likes of Louise Bourgeois. The show will be accompanied by a fully illustrated catalogue and a symposium at The Kitchen on October 27th.